Coffee is one of the most popular drinks in the world. Coffee can be drink at any given time, but mostly at the morning when people need to be extra awake and to energize their morning. The most commonly consumed coffee at home is packed ground coffee, which can be easily prepared by only pouring hot water over it. Some of packed ground coffee brands available are Folgers and Taster’s Choice. If you are in need for a good start in the morning, read our article below. Folgers is an American coffee brand and is apart of the J.M. Smucker Company that has been one of the best-selling coffee ground brand in the United States since 1990s. Folgers is known for its slogan “The best part of waking up is Folgers in your cup!” with its jingle that have been accompanying the brand since 1984. Folgers brand has eleven brands that are available in the United States. Classic Roast including Classic “Red Can” and half-caffeine medium roast, Classic Complements including Gourmet Supreme (Dark Roast), 100% Colombian (Medium-Dark-Roast), French Roast (Medium-Dark-Roast), Black Silk (Dark Roast), and Breakfast Blend (Light Roast). Other than variants mentioned earlier, Folgers also has Simply Smooth, Folgers Gourmet Selections, Flavored Coffee, Instant Coffee, Singles, Home Cafe Pods, Cappuccino, Folgers Flavors Coffee Enhancers, and Folgers Iced Cafe Coffee Drink Concentrates. Among those variants, one the most popular Folgers coffee ground is the Medium-Dark Roast 100% Colombian coffee ground. You can also read our previous article on Folgers Vs Starbucks here. Folgers 100% Colombian Coffee is made with entirely with Colombian coffee that has a distinctively full-bodied taste that you will be looking forward every morning. The taste is quite bold and is distinctively rich and unique. The coffee are delicately balanced and perfectly blended to give you the best experience and delight your senses in each brew. Taster’s Choice is a brand of coffee ground product by Nestle. Taster’s choice itself is actually Nescafe, which is a portmanteau of “Nestle” and “cafe”. Taster’s Choice was introduced in the United States and Canada around late 1960s to supplanted Nescafe for many years before reintroduced as Nescafe again in 2003. Just like many other Nestle brands, Nescafe is being sold in almost every part of the world. Taken form nestleusa, Nescafe Taster’s Choice is a well-crafted coffee that was designed to ease your morning coffee routine. The product claims that the coffee ground was selected only from the highest quality beans and then roast, brew and flash freeze the coffee to retain its fresh, rich flavor and aroma. Tester’s Choice is available in many varieties of premium blends and also comes in different sizes to suit the taste of every coffee drinker out there. Those varieties including classic House Blend, Decaf, French Roast, and Colombian. Among them, the most popular variety is the House Blend. The House blend variety is a mix of different variety of coffee, which unfortunately not explained or written in the product, so we don’t have enough information about it. The House Blend itself is a light-medium roast, which means the coffee ground retains some of the original characteristics and the brew may vary from light to dark brown. 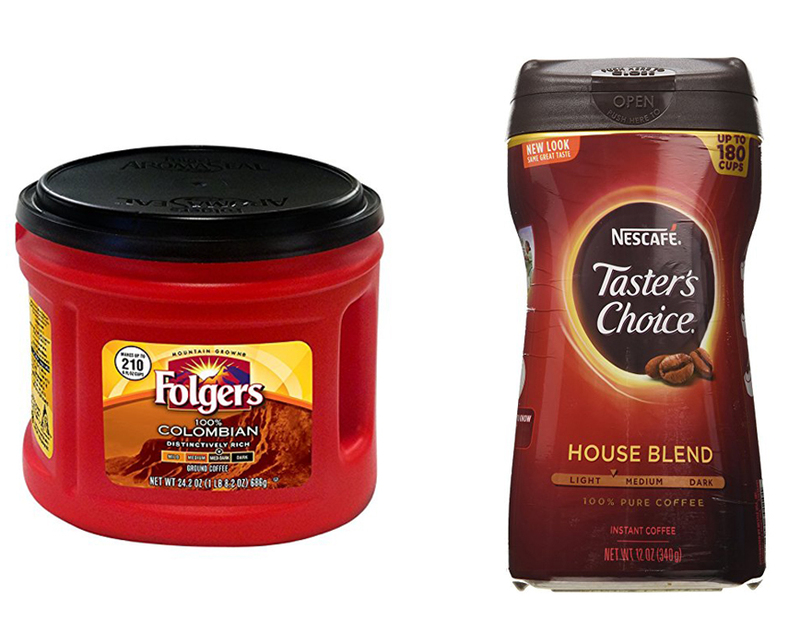 When comparing between both of Folgers and Taster’s Choice, some of you may already have your favorite. Some may prefer one better; some may love both or none of the above. It is understandable, since we all have our own preferred taste. If you are specifically comparing the Folgers Colombian and Taster’s Choice House Blend, then you may decide based on the roast levels. Folgers Colombian is full-bodied medium-dark roast, while Taster’s Choice is light-medium roast. If you prefer your coffee to be darker and have full-bodied taste, we highly recommend you the Folgers 100% Colombian.